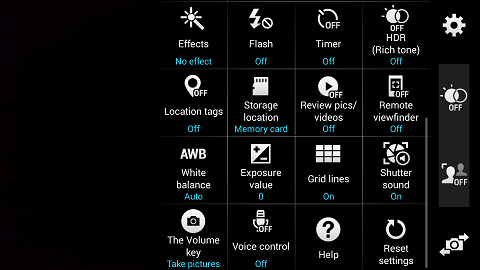 The coolest feature of the Galaxy S5 camera is Voice Control . 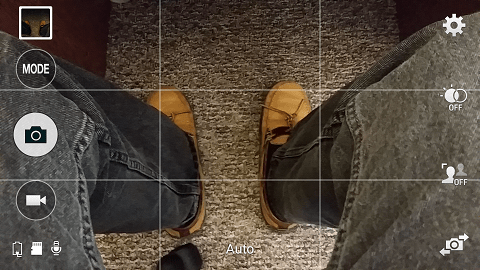 You can access this feature from within the camera app. In the upper right hand corner, you will see a gear-like icon. As in most cases, the gear symbolizes the settings menu. The settings menu can be accessed by tapping on the gear icon in the upper right hand corner. Tap on the gear icon, and the settings menu will appear. Place and hold your finger on the menu. Slide it upwards to move to the bottom of the choices. You will see one called “Voice control” that has a microphone for an icon. Tap on this, and it will open a window that shows you the voice commands you can use. After this, the blue “Off” will turn into “On”. To take pictures, you can say “Smile”, “Cheese”, “Capture”, or “Shoot”. To start a video recording, just say “Record video”. You need to speak clearly in order for this to work. I have found it helpful to select the setting to turn on the Shutter sound. This way you can tell when your picture has been taken. I find it useful when taking pictures in low lighting. By using voice control you don’t have to worry about the shaking of your camera caused by tapping on the screen to take a picture. This also comes in handy when taking group pictures. Set up your phone on a tripod or even just propped up on a table. Make sure that everyone is in the frame, then join them yourself. Say “Cheese” loudly and clearly, and everyone, including you, can be in the picture. This feature should stay on now until you turn return to the menu and tap the voice control icon to turn it back to “off”. Would you like to learn how to do more with your phone? Set up an appointment with the Coaches of Technology. Coaches of Technology is committed to helping people use technology effectively and wisely in their professional, educational, and personal lives. © 2018 Coaches of Technology, Inc.